While some will embrace the opportunity to be part of a global event which is geared towards the climate, Earth Hour also inadvertently associates cut-backs, sitting in the dark, and putting up with discomfort with care for the environment. There is a big risk that this symbolism is above the heads of the average member of the public. Moving forward on climate change should be framed as a big opportunity to restructure the economy, herald a new era of renewable energy, and build resilient local economies that are independent from fossil fuels. Initiatives like Earth Hour focus attention on the issue of climate change, but also reinforce the idea that in order to do anything about it we will all need to be sitting by candle light, quietly and perhaps painfully ignoring anything powered by electricity. At best, there is a quiet rankling by the average person who doesn’t buy into the idea, and at worse there is a backlash campaign like the Human Achievement Hour, which encourages people to turn on their lights not-so-coincidentally at the same time as Earth Hour. 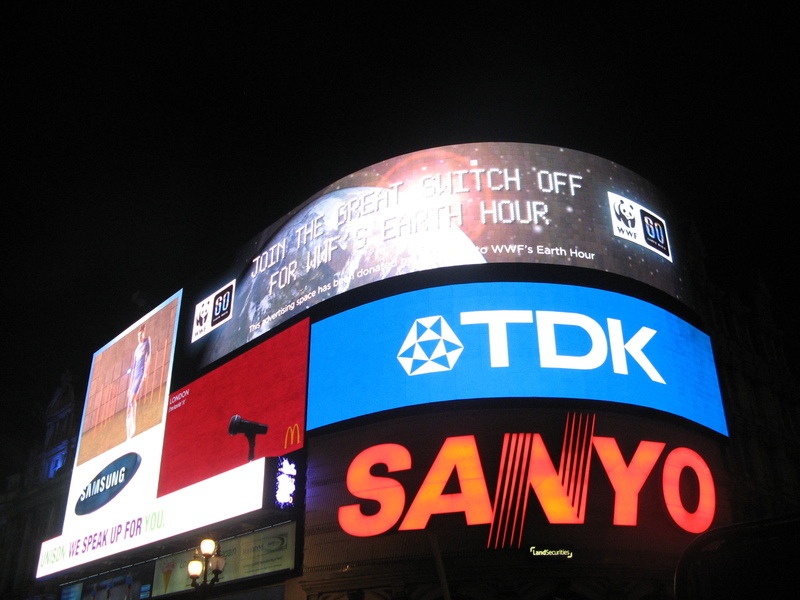 Kinda Ironic…Earth Hour 2011, Piccadilly Circus, London. Encouraging an individual to make a small personal sacrifice for Earth Hour, might also have an overall negative effect in terms of energy conservation and longer-term behaviour change. A recent study has shown that those who use re-usable shopping bags, may ‘reward themselves’ with junk food. While this is certainly not the last word on the matter, it does highlight one of the dangers of once-a-year, holiday-like environmental participation, namely that it provides the individual with a feeling of satisfaction which then works against taking additional (and more meaningful action). In a time in the environmental movement when we should be pushing forward with exciting opportunities for renewable energy, Earth Hour keeps us rooted in the era of just making sure to turn off the lights. And if conserving and valuing energy isn’t already part of your life, then doing so at least once a year should clear your green conscience, right? If you do take some time and think about what Earth Hour represents, perhaps you come away thinking about climate change and adapting new personal habits, maybe giving some time or money to a local cause. But the message is muddled and the small gains that might be had are not worth the risk. If you are still interested in turning off your lights for a good cause, may we suggest International Dark Sky Week?